My Grandma’s name was Rosa (“rose” in Russian). Today we would have celebrated her 96th birthday. I had two months to come to terms with this loss, and this post is not a call for sympathy. Thinking about my grandmother and her role in my life, I realized that most of you who reads this post today would have never met me, had I not inherited my Grandma’s love for perfume and decades later decided to write a story about my first and everlasting fragrant love – Lancôme Climat, the first bottle of which was gifted to me by her. So I want you all to “meet” her and help me to celebrate her life. Image: I doubt any other pictures of my grandmother are out there, so I wanted to leave a digital sillage of Rosa in the Universe. I took a picture of one of my favorite photos of her and Climat bottle that she gave me all those years ago. This entry was posted in Favorite Perfumes, Meeting People and tagged Climat, Lancome. Bookmark the permalink. What a wonderful tribute to your grandmother Rosa! She’s beautiful and so glad she passed her love of perfume on to you. What a beautiful woman – with a lovely sweet expression. I can imagine how associating your much loved grandma Rosa with perfume would leave a lifelong sense of how special and how important the enjoyment of life’s beauty is! Thank you, rosestrang. I think she would have been pleased to read your kind words. She was beautiful. This brought tears to my eyes, Undina! This is such a loving tribute to your grandmother. I knew both of my grandmothers and they died too young. That said, if I even inherited one tiny ounce of their elegance, I would not need perfume as a substitute. Thank you for coming here to meet my grandmother, hajusuuri.I think we’re lucky to have parents and grandparents after whom we’d love to take. And now her digital sillage is out here with us. Thank you for sharing. Grandmothers are truly special. I’m glad I did it: pre-Generation X online presence is much more limited, and those black & while photos in old family albums or shoe boxes, most likely, won’t survive long after the above-mentioned generation is gone. This way my Grandma’s picture went out to the digital Universe and will stay there for years and years. How wonderful that the perfume your grandmother gifted you is the one that has endured, just as her memory will. I never had a close relationship with a grandparent, but seeing my niece with my mother makes me see how valuable it can be. I’m glad you had that bond. Do you look at all alike? In addition to my love to perfumes, I inherited my Grandma’s figure (mine is slightly better) and eyebrows (hers were much better :) ). As I wrote in my answer to Tara above, I think I got from my Grandma my figure and eyebrows. I would love to have her hair as well but, alas, genes didn’t combine this way. As for eyes, those are definitely courtesy of my mom (though hers were much more beautiful than mine are). Rosa is a beautiful name and that bottle of Climat will be an everlasting token of her in your life and in your heart. 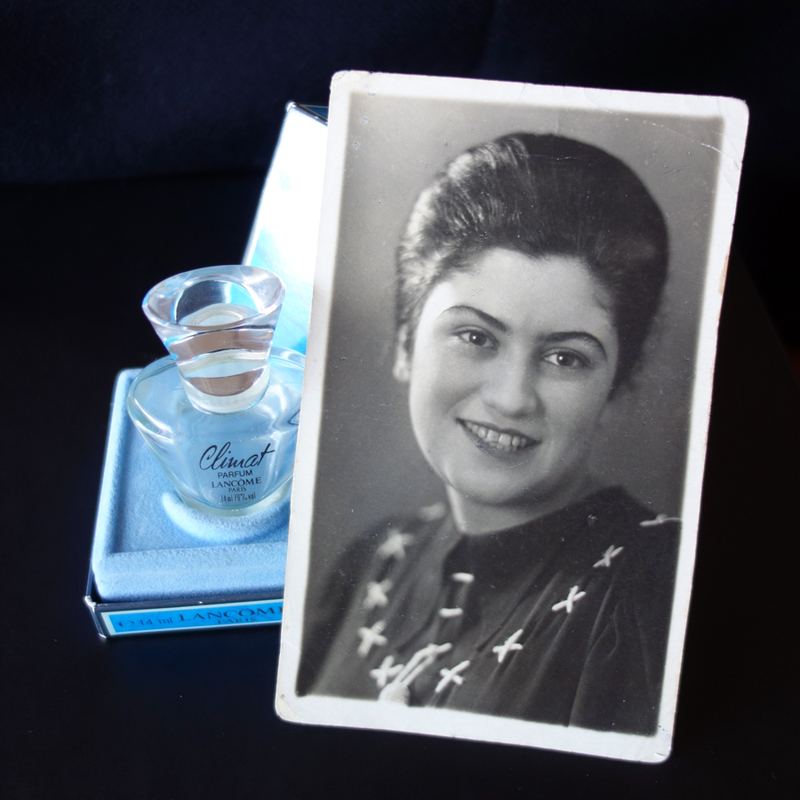 How much do I love the expression ‘digital sillage’ – and how lovely to combine a beautiful photo of your grandmother with a shot of the perfume that keeps you close to her. Like Tara, I did not have a close relationship with a grandparent, but my mother was born in the same year as your grandmother(!) – in May 1920 – so it does link me to the same era. I am sure you will miss talking to your grandmother for a very long time to come, but it really is true that you can keep people alive in your memory, up to a point at least. Thank you, Vanessa. I do feel an acute emptiness at the time of my daily calls to her but it’s not like anything can be done – so I’ll just try to hold on to good memories. And keep wearing my favorite perfume. Beautiful way to remember your grandmother. I love this! A beautiful tribute for a beautiful woman. My grandmother was also my introduction to perfume. I am with you. Love and peace. You are so lucky to have had such a lovely grandmother. Your site is great! So glad to have found it!